I don’t watch a lot of horror movies but a Blockbuster employee told me Insidious was the best movie in the genre that he’s seen in a decade so I decided to pick this one up. Now, I know what your thinking. One, who still actually goes to Blockbuster stores these days? And two, why should I care what some stoner movie nerd thinks makes for good entertainment? 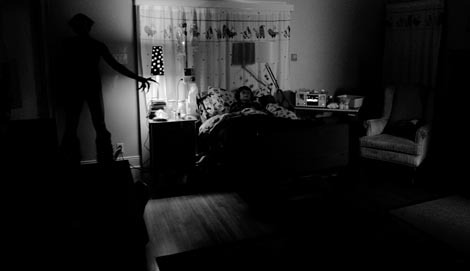 The subject matter of Insidious actually makes for an interesting story. While heavily inspired by classic Lovecraft, without giving anything away, the script delves into familiar territory but also settles on a plot element not normally used as a horror trope. This alone certainly deserves some notice but it is not enough to fulfill a vision. There are a lot of plates to balance when making a motion picture and unfortunately with Insidious the execution is lacking. The acting is unconvincing and the dialog is derivative at times. The visuals of the demons are uninspired and even downright campy. There are definitely some unintentionally laugh-out-loud moments that make this feel like a B movie. However, and pun intended, there is something much more insidious going on that this film does a great job at- misdirection. The creators are actively aware of a moviegoer’s preconceptions and expectations and stay one step ahead. I like the twist and the meta design of the movie – using the crazy wife or the sick boy as red herrings. The makers of this film go further than merely keeping the audience guessing- they realize that their viewers have a wealth of horror movie knowledge that they will enlist to attempt to predict what happens next. 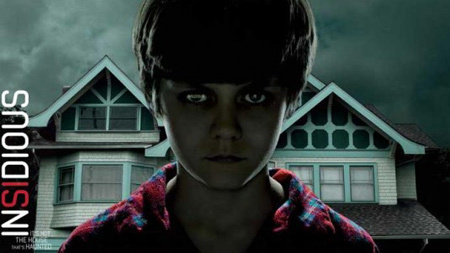 There is a reason this movie borrows heavily from Poltergeist and The Exorcist. The tagline “It’s not the house that’s haunted” seems to give away the mystery while actually leading viewers to the incorrect conclusion. The interesting twist ending is more complicated than it initially appears- the camera work subtly hints that something else is happening to keep the audience off guard. Even the box art leads the mind astray. Now *this* is managing the meta of a movie. It’s not a great movie but remains worth watching. Some scenes can be cheesy but still scary. And the script has flaws but redeems itself in interesting ways. I can see why someone who watches a lot of movies would like this one, so in the end maybe the Blockbuster employee didn’t steer me wrong.